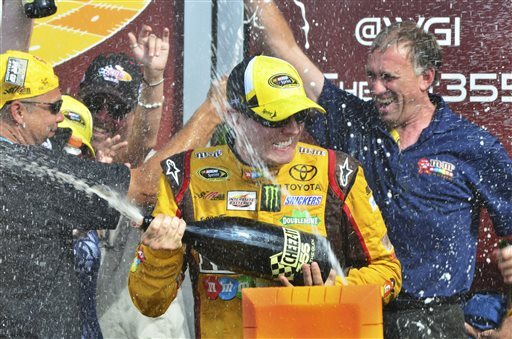 WATKINS GLEN, N.Y. (AP) -- There was no slipup on the final lap this time, so Kyle Busch's victory celebration at Watkins Glen International was as sweet as it gets. WATKINS GLEN, N.Y. (AP) — There was no slipup on the final lap this time, so Kyle Busch’s victory celebration at Watkins Glen International was as sweet as it gets. Bumped aside a year ago by Brad Keselowski on the final lap as they sped around an oil-covered track, Busch held the reigning Sprint Cup champion at bay on a two-lap dash to the checkered flag Sunday. Busch kept his foot on the accelerator a tad longer than usual during his postrace burnout, even sticking half his body out the window while smoke swirled all around and the tires kept churning. Keselowski finished second in this race for the third straight time, and challenged Busch on the final lap, pulling to his rear bumper at one point. There was no bump this time. “We had a shot at it,” Keselowski said. “I was going to have to wreck him to really get it, and I didn’t want to do that. There’s racing and there’s wrecking. Those are two different things. Racing can be all about luck sometimes, and Busch couldn’t get much luckier than he was on this day. Polesitter Marcos Ambrose dominated the race, leading 51 laps, but his good fortune — he was seeking his third straight Cup win at The Glen — finally ran out just past the halfway point of the 90-lap race. Crew chief Dave Rogers was planning to have Busch pit on lap 60, but his crew noticed fluid on the track and brought the No. 18 Toyota in a lap early. Busch was in the pits when a caution flew and Ambrose had to pit under yellow, losing his spot to Busch at the front. “That was a game-changer right there,” said Busch, who won from the pole in 2008 at The Glen. Busch held on through a series of cautions over the final 28 laps. Ambrose, who restarted 12th, crashed late trying to make a run with an ill-handling car and finished 23rd. He entered the race with an average finish of second in five previous starts at Watkins Glen and also had won all three Nationwide races he’d entered at the storied road course in upstate New York. The field didn’t have to worry about five-time Watkins Glen winner Tony Stewart. The man known as Smoke is out indefinitely after breaking two bones in his right leg last Monday night in a sprint car race in Iowa. Stewart, who has undergone two surgeries, saw his streak of 521 consecutive Cup starts come to an end. Max Papis drove Stewart’s No. 14 Chevrolet on Sunday and finished 15th. Martin Truex Jr. was third, followed by Carl Edwards and Juan Pablo Montoya. Clint Bowyer, Joey Logano, Jimmie Johnson, Kurt Busch and AJ Allmendinger rounded out the top 10. Jeff Gordon entered the race with momentum in ninth place in the points standings after a second last week at Pocono, but his day was ruined early with a wreck on lap 15. The four-time Watkins Glen winner finished 36th and dropped to 13th in the standings with four races to go until the Chase for the Sprint Cup title starts. The top 10 drivers in points and the drivers from 11th to 20th with the most wins earn wild-card berths for the 10-race postseason. Kurt Busch moved into 11th place, just two points behind Truex and only four behind ninth-place Greg Biffle. Ambrose was unchallenged for the lead through the first half of the race, building a margin of nearly 3 seconds over Kyle Busch, who started fifth and was up to second by lap 21. Busch had been unable to close on Ambrose before a red flag flew midway through the race and was focused on the No. 9 Richard Petty Motorsports Ford in front. On the ensuing restart on lap 43, Ambrose again sailed clear of the field, building a cushion of 3.5 seconds over Busch as the final pit stops loomed. The complexion of the race changed when Aric Almirola blew a right front tire and slid off course into a tire barrier, bringing out that fateful caution. When the race restarted, Busch was in front with Keselowski third and Ambrose 12th, and the car that had dominated the race out front became just ordinary in traffic, unable to move forward. Nine laps after the restart and struggling, Ambrose had picked up only one spot and trailed Busch by nearly 10 seconds. Truex managed to pass Busch on lap 65, but Busch banged past him in the Inner Loop seconds later and Keselowski followed into second. Keselowski stayed close for a while, but Busch began to pull away just as he had a year ago when oil spoiled his day.